Congratulations! Your big day is quickly approaching. Your invites have been sent out and you only had to chase down about a dozen RSVPs, your DJ is booked and of course, your restroom trailer rental is taken care of. So now what? 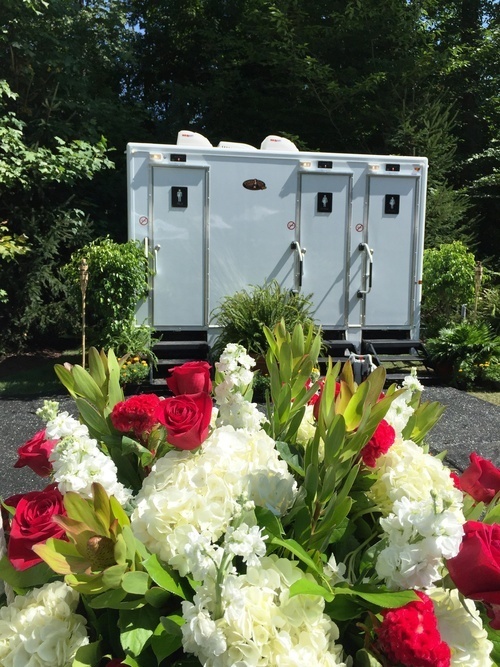 You don’t want to completely ignore your restroom trailer on your big day, do you? There are plenty of fun ways to spruce up your trailer rental! Whether you’re a fun, goofy bride or a romantic at heart, we’ve got a few tips on how to make your restroom trailer stand out. It is what it is, so have fun with it! If you’re the type of bride who’s a little more laid back, then you’ll definitely love this. It’s a bathroom, so why not make it fun? You can hang funny signs or sayings on the doors, or even write out your favorite toilet humor jokes. If that’s not your thing, that’s totally fine too! Try taping pictures of you and your husband on the corresponding units so your guests will know which one belongs to ladies and which one belongs to gentlemen. Prepare for the elements: Depending on how large your rentals are, you can easily throw a tent over them to create a classier look and feel. Use flowers or candles to lead your guests into the tent and add some bathroom essentials like moist towelettes, lotion and tissues on the sink counters for a more intimate feel. Make it your own: Incorporate your wedding colors and themes into the design—if your wedding is nautical themed, you can add anchors and stripes along the outside or decorate the inside with matching themed hand towels and decor. For a more romantic feel, add some battery operated tea lights, flowers or white Christmas lights. Since you’ll have plenty of space inside, add baskets of towels, essential oils, Q-tips, deodorant or whatever else you think might be essential for you and your guests. Go all out: It’s your big day—so why not splurge? Our Elegance series ten station restroom trailer offers plenty of room for the bride with the long train or heavy dress. Not only that, but our restroom trailers have counter space for decorating and fresh water for hand washing. Whatever you decide, make sure to include Superior Portables in your big day planning! We offer competitive pricing and clean, beautiful units for any size wedding! Call us today at (800) 475-0049 to discuss your needs and we can help you determine the perfect restroom trailer for your wedding.